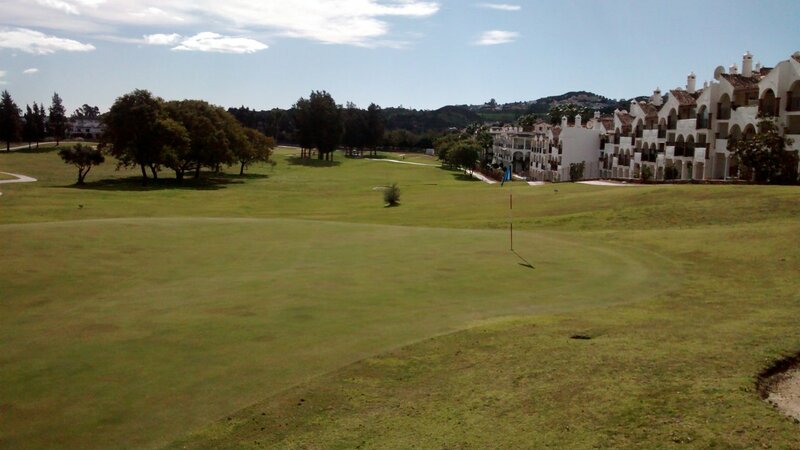 This golf course is one of two (Los Lagos and Los Olivos) at the Mijas golf club. The clubhouse is a bit of a rabbit warren, the check-in desk can be quite busy and the first tee for the Los Olivos course is a few minute walks from the clubhouse. You also have to check in at the starters hut before proceeding to the 1st tee. Allow plenty of time to start the game, otherwise you can easily miss your tee time. The clubhouse is medium-sized and informal. Pleasant shaded terrace to sit and have food/drinks. I thought the food good and not expensive. Membership is about half British, the rest mostly Northern European. The Los Olivos golf course is flat, like Los Lagos. But Los Olivos is older and does not benefit from the new construction and initial high standards of Los Lagos. The main area this shows is in the grass, which is scruffy pretty much everywhere. Clearly the club is not trying to recover this situation, and simply mowing what they have left. So fairways have wide diversity of grass. Still decently playable, but nothing positive to say about them beyond that. Off the fairways all the grass is mowed slightly longer, so not difficult to play out of. There is no true rough to speak of. Sparse mature trees line most fairways. Fairways are good width and no real challenge, although par 3s are quite tight. There is a series of small lakes that come into play on 6 of the holes. All are missable if you take a conservative line. All tees have carved slate hole maps mounted on concrete and the scorecard has a fairly accurate small course map. I got 'lost' a few times walking off a green looking for the next tee box. A few more or better-positioned 'Next Tee' signs would be helpful when several holes are close together. The key original features of Los Olivos are still there. These are the greens and bunkers. Those have all the difficulty in what is mostly quite a tame course. The greens are quite large, often kidney-shaped and the majority have fairly severe slope. They are tightly mowed and quite fast. A lot of them are also raised up and domed. This makes approach shots a bit of a lottery. One ball landing on a green can bite and maybe roll 1 meter back. Another ball landing on the same green 1 meter further on can bounce forward and roll a few meters right off the edge of the green. To some people this is difficulty. To me it is randomness. As a mid-handicap player I do not have a hope in heaven of controlling an approach shot from 20+ meters out to the nearest meter. If you really wanted to play the greens for exact position, you would literally have to know the contours of every green very well. No casual visitor is going to know that. For average golfers, the key to short approach shots on Los Olivos is simple – putt whenever you can from just off the green onto the green rather than play lofted pitch shots. Two reasons: 1) the grass around the greens – like the rest of the grass – is tightly mowed, so your golf ball is not likely to be held up if you putt from just off the green and 2) you are more likely to be safely in the middle of the green in maximum further 2-putt territory. The bunkers are very distinctive. They are all blob-shaped. By that I mean not round or oval, but with curvy edges (like a fat figure-of-eight). Bunkers are often close to the edge of the greens and have rims that are not severe (maybe a few centimeters high), the sand is bowl-shaped. The sand itself is coarse-grained (deliberately to stop the sand blowing away in the wind) and has plenty of small stones. The bunkers are still quite easy to play out of and it is not difficult to get a wedge well under the ball. You could even almost pitch out of some of these bunkers if you were worried about a ball racing away after landing on the green (e.g. deliberately pick a landing zone for your pitch on the green surrounds then have the ball trickle on to the green). The bunkers and greens are integrally designed to make the last 2 shots on every hole the key ones. I mean notably more so than on other courses. This design philosophy repeats on every hole. The hazards nibble at your score, rather than blowing you away every now and then. As a mid-handicap player, I find Los Olivos quite dull. Maybe I am just not a fan of the basic design of bunkers and greens. 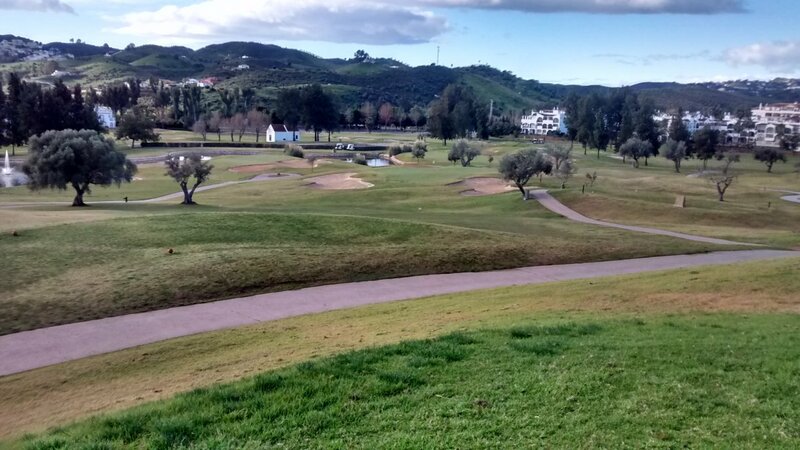 The course is certainly an easy one for low-handicap players. I suggest this course is a good one for players in the 20-25 handicap range. Enough variety of hazards for them to negotiate and an easy course to walk. A good course and cheap enough for fairly casual golfers who only play occasionally. Compared to Los Lagos, this is not a golf course I rate much. And I think the price differential (Los Olivos is only marginally cheaper than Los Lagos) is a bit out-of-line. 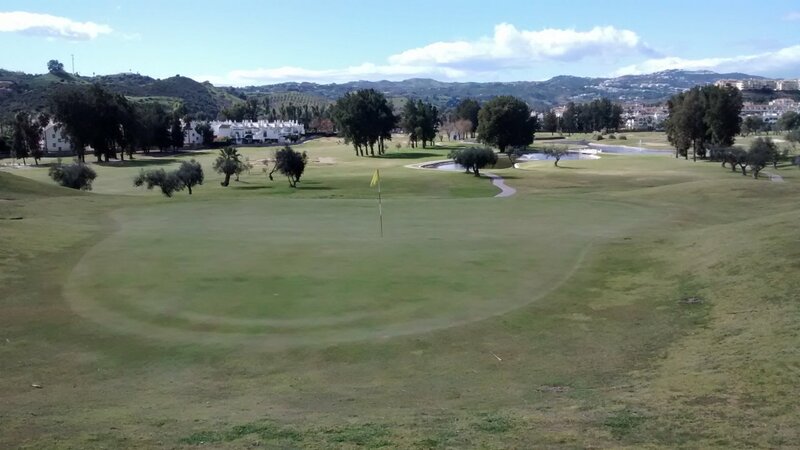 For a price of a round at Los Olivos - or only a little bit more money - there are other nearby golf courses on the Costa del Sol that IMHO are a nicer golfing experience. This course is not to my taste, but it may certainly be to yours. Los Lagos is represented by the yellow dot on the right hand side of the graph. Los Olivos is represented by the brown dot in the middle of the graph. This shows that Los Lagos is much longer than the average golf course on the Costa del Sol, while Los Olivos is slightly under average length. Neither course is particularly difficult taking it's length into account. An 18-handicap player can expect to go around Los Olivos in 19 over par and around Los Lagos in 20 over par.